This presentation will examine the rise of right-wing populism in the U.S. and Europe and the associated widespread development of “inter-civilizational” conflict. It will also analyze how the “international community” has sought to deal with the issue at the United Nations. Jeffrey Haynes is Emeritus Professor of Politics at London Metropolitan University, UK. He has research interests in several areas, including religion and international relations; religion and politics; democracy and democratization; and the politics of development. Haynes has 240 publications, including 44 books. 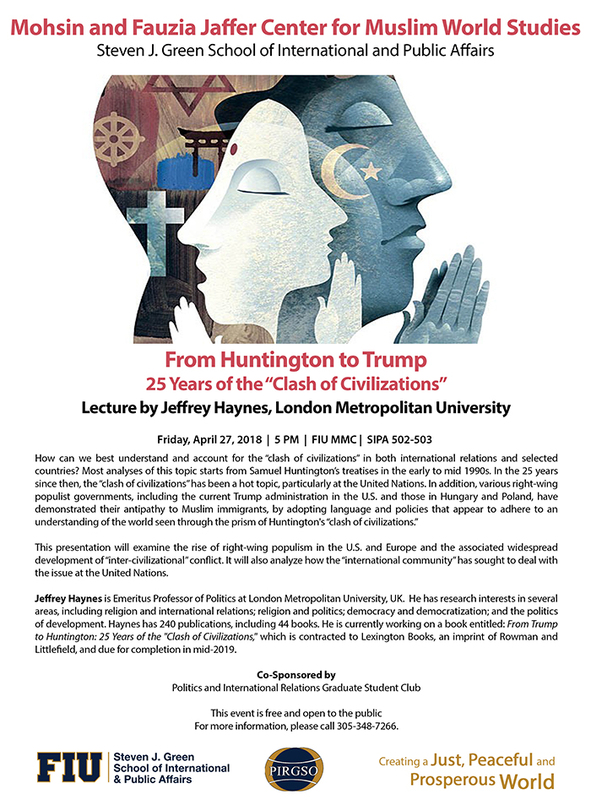 He is currently working on a book entitled: From Trump to Huntington: 25 Years of the "Clash of Civilizations," which is contracted to Lexington Books, an imprint of Rowman and Littlefield, and due for completion in mid-2019. This event is free and open to the public For more information, please call 305-348-7266.